A shade of embarrassment passed through his face for a moment. He was prepared for conflict but not this type of response. He murmured, repeating himself “you don’t even have a boarding pass yet.” I shrugged indifferently and pointed with my hand the gap between the person and me in front of me, letting him fill there with his giant posture. Boy, how he seemed confused. This was an example of the madness happening everywhere in the world, on a microscopic scale. For the past years, we have seen the right-wing rising in many countries, including my own. We have seen that Yoda was right, that fear was indeed leading anger. Anger was leading to hate and eventually, hate was leading to the dark side. The acts of decency keep going viral in social media because it is the last thing we are expecting from ourselves and others. I have been traveling for a while now, and I come to learn that all of us is just the same regardless of the country we grew up in. We all laugh and cry the same. We all strive the same basic things in life, such as being happy and healthy. A genuine smile means the same in all languages, and it is the key to lift the barriers among us. Sadly, many people who just spent their whole lives inside their small circles aren’t aware of this simple fact. That is why the acts of decency keep going viral in the social media because it is the last thing we are expecting from ourselves and others. In this age of hate and fear, staying decent is a great way to resist the darkness. It is a statement made by just existing. That is why, after Ian Grillot intervened the shooter in the Kansas City Bar; we watched his interview with the tears in our eyes. That is why, when Australians started the #Iwillridewithyou campaign, for defending Muslims in the public transport vehicles, it warmed our hearts. That is why, when Antoine Leiris, a Frenchman who lost his wife in the gruesome Paris shootings, wrote an open letter to the terrorists with the title “You will not have my hate”, millions of people were deeply moved. 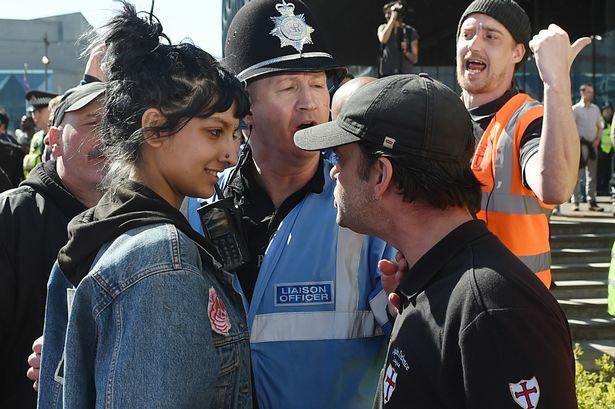 And that is absolutely why, we are now all sharing the photo of Saffiyah Khan, smiling with all her grace at the face of the racist EDL (English Defence League) leader. Teach your children to be decent and kind; don’t feed them on hate and fear. Teach your friends or even the strangers that selfishness is not the only way to survive. Stay humane, do not lose to your anger, also when the conditions are forcing your hand. So this is my call to anyone who is reading: Do not look for the light to take shelter. You are capable of casting a tremendous amount of light yourself. That is how you fight with darkness, by becoming the very light, you are seeking for.